Whether you are a commercial client or homeowner in Eureka, CA, Wing Solar & Wood Energy, Inc. offers a variety of options designed to provide alternative energy sources that have real results while also saving the environment. Below you will learn briefly about those options. We encourage you to continue your tour of our site. If you have questions or we can assist you in any way, please feel free to contact us toll free at 1-800-492-4061. For your convenience, you may also request more information from this site. At Wing Solar & Wood Energy, Inc. we realize an investment in alternative energy can be a tremendous financial commitment. We are proud to be affiliated with a variety of financial institutions to offset the cost of your purchase. Below we have included some of the programs in which we refer numerous clients to. Solar Electric PV Systems can be ground or roof mounted. If necessary a solar tracking system can be attached to a pole mount. Grid-tied solar electric systems can also take advantage of the new micro-inverter technology, allowing each individual panel to be monitored. Micro-inverter technology allows you to stay current with each panel and its production. Please view our On Grid/Grid Tie page or Off Grid page for more information. Solar hot water systems circulate water through collectors making them perfect for producing mass volume of hot water. For this reason, they are generally used in larger homes, pools and spas. For further information about our solar hot water systems please view the solar hot water page of this site. Passive hot water systems have no pumps, controls, or moving parts. This type of system uses gravity and temperature differential to move hot water. The simple nature of this system provides the most reliable and cost-effective solution to hot water heating. For further information about our solar hot water systems please check view the solar hot water page of this site. Hydronic Heating includes radiant floor, in slab or raised floor, baseboard and new or retrofit forced draft systems. All of these systems use hot water to heat your home which eliminates the dry heat of most heating systems. Radiant and baseboard systems also lend themselves to zoning which allows you to set the temperature of each room independently. For further information about hydronic heating please tour the hydronic radiant heating page of this site. Water stoves offer the safest way to heat any structure. All fire and wood debris is removed from the home and only hot water is pumped inside providing you with purer, cleaner air and lower insurance rates than an indoor wood stove. In addition, there is no loss of living space. These units are vented into the air, eliminating the danger possibilities and regulations of a pressurized boiler. Wood stoves will also burn almost any type of wood cleanly, safely and efficiently. They are available with a gas or oil backup. To learn further about our wood burning stoves please tour the wood furnaces page of this site. Energy solutions for the future are increasingly depending on the use of renewable energy resources such as the reliability and efficiency of wind power turbines. Wind Turbines can be used to offset your electrical system if it is windy in your area. If you are considering investing in a wind turbine in Eureka, CA there are a few factors that should come to mind. Your Annual Energy Consumption In Kwh. The Average Annual Wind Speed In Your Area. Are There Any Restrictions In Your Area For Wind Turbines. If you are asking yourself, "How do I find out the average wind for my area?" Click here to view a WPA Wind Map on the US Department Of Energy website which may be helpful. For further information about wind turbines please contact our office toll-free at 1-800-492-4061. We would like to invite you to continue your tour of our website. If you are in Eureka, CA and have further questions or would like to schedule a consultation with our client care specialist, please contact Wing Solar & Wood Energy, Inc. toll-free at 1-800-492-4061. For your convenience, you may also request more information from this site. 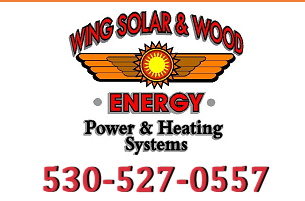 Thank you for your interest in Wing Solar & Wood Energy, Inc. We look forward to serving you in the near future. Proudly serving northern California including the cities of Anderson, Chico, Clear Lake, Crescent City, Eureka, Grass Valley, Lake Port, Orobille, Red Bluff, Redding, Shasta Lake, Susanville, Williams, Willows, Woodlands, Yreka, Yuba City and the surrounding area.